Apparently, the old vintage looking location on Georgia had closed down and there is only now the one on Pender. It’s a super funky salon, square pyramid mirrors, interesting layout, and lots of natural light with all glass windows on one side. I received a bottle of oil treatment – it smells like Vanilla – OMG it’s so good! I will have to go back to get some more of this once I run out…you massage a dab of it after you’ve toweled dry your hair after washing. Keeps it not only smelling nice, but down especially if you have dry brittle hair. On their website, it says it’s $30. It doesn’t indicate how many ml…but I’m guessing it’s the same size as the one I received, which is 120ml. It’s in a glass bottle with a pump, so after use, you can wash it out and use it for something else – like for shampoo for soap dispenser. I was suppose to get the $10 gift certificate to use for next time. They took my email address so they can send it in. It’s been about a few months, and I still haven’t received anything. Ok, so I’m in no rush to get a haircut at this point, but it would be nice. Ok, so I guess I’m a little lazy in not asking them about it…but hey, where’s the service if they can’t do it properly. Steve gave me 3 cards that give first-time customers 10% that come and see Steve. Not sure if I can use this…I guess not, since I would no longer be a first-time customer. Overall, the service was good. Steve brought me water while I was waiting for the deep conditioning to set in. We didn’t talk much, but I prefer it that way – not those chit chat people that tells their life away with their stylist. My friend is like that. I think he only goes to rant – almost like seeing a counselor, lol. For payment, there was the $2 tax and $1 environmental fee, and of course, the tip. Don’t forget just because you’re using a voucher. This entry was posted in Beauty, Services and tagged deals, deep conditioning, downtown, hair, haircut, salons, style, trim on December 19, 2013 by idearabbit. Do you suffer from acne? Are you an adult, but still breakout like you’re a teenager? Tried everything on the market and frustrated that nothing ever seems to work? Well, then Clinique may be the answer for you. I was introduced to Clinique by a guy who didn’t seem to be having that much skin problems. But he was trying everything on the shelf, so he knew way more than I did. I have been suffering from severe acne since I was 11 or so. I don’t know how many times I’ve gone to the doctors to get it treated. I tried all kinds of creams, but nothing ever worked. It wasn’t until I went to live in Japan that I was given some TCM (Traditional Chinese Medicine) which REALLY helped. I was super happy. I stopped taking them, but it didn’t get worse again and stabilized. However, it didn’t mean that I was all free from acne. I still broke out, never as bad as before, but still. When I went on the one year of being on a strict healthy diet, I noticed that my acne significantly decreased. Since then, I’ve noticed that if I eat chocolate, sugar, buttery food, or chips, I break out – so I mainly avoid those foods as much as possible. 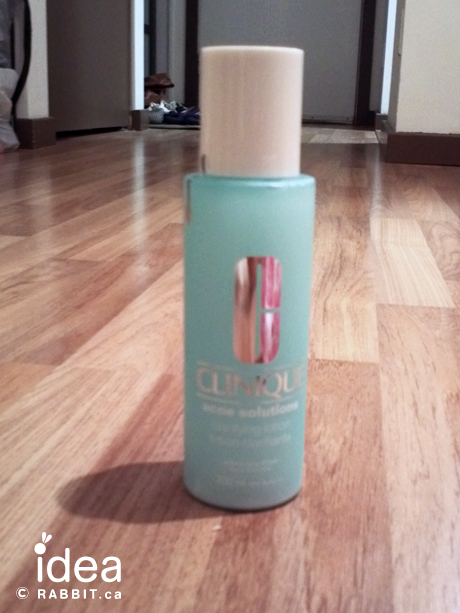 To help the skin from the outside, I now use Clinique. 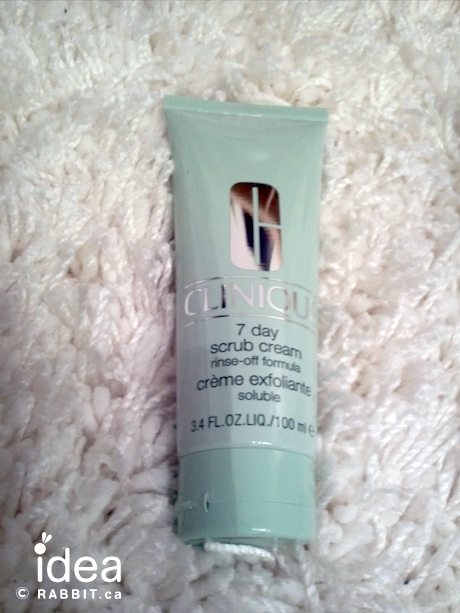 I started using the 7 Day Scrub Cream Rinse-Off Formula $24.00 CAD and Acne Solutions Clarifying Lotion $17.00 CAD. I wash my face with a gentle soap, then massage the scrub. I rinse and dry. 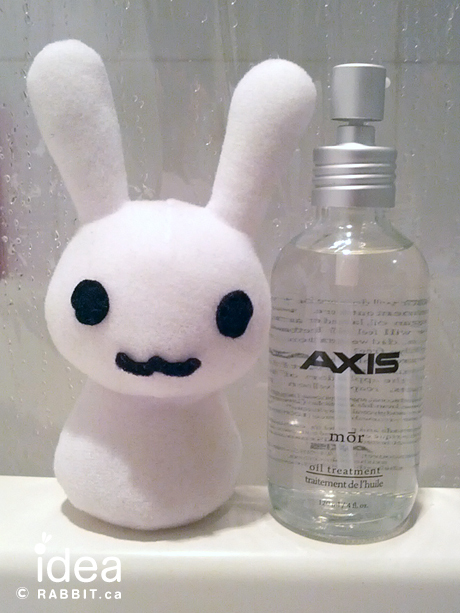 Then I apply the Acne Solution with a cotton pad. After a week, I noticed that I was clearing up. I noticed that I didn’t break out as much. I was really satisfied. 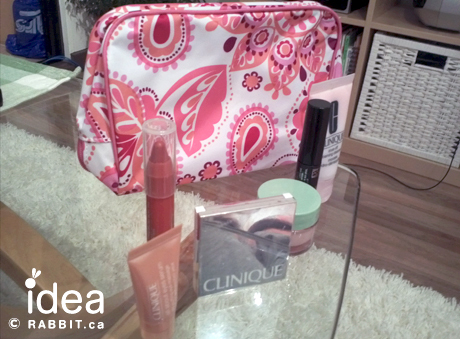 When I bought the two items, they were doing a special at Hudson Bay where you got a free gift bag with samples inside. One of the samples was the Moisture Surge Intense Skin Fortifying Hydrator. I apply it at night around my eye and corner of my mouth to soften the wrinkles. I am hoping to buy the Dramatically Different Moisturizing Gel next time since my Mary Kay’s moisturizer is running out. Free gift bag during promotion with creams, lipstick, eye shadows, mascara, etc. The prices are pretty affordable compare to other competitors. And if you can buy when they’re giving out the free gift bags, bonus! What I like about Clinique is that they’re 100% fragrance free. That doesn’t mean that they smell like crap. I’m really sensitive to fragrance so this is good. However, after talking about acne with one of my friend, she said that Clinique didn’t work for her. So I guess it doesn’t work for everyone. Before taking the leap into investing into Clinique, go to one of their booths in major department stores like Hudson Bay or Sears and ask for samples. They’re really good out handing samples out (on certain items though). This entry was posted in Beauty, Health and tagged acne, beauty, cosmetics, creams, health, lotions on January 26, 2013 by idearabbit.